Some general cooking terms need to be learned when you learn to cook everything. When they appear in a recipe you will know immediately what they mean; poach, bake, broil or braise rather than frying. The list below is a thorough listing of terms; many you will only see occasionally in recipes but others will appear every time you cook. Knowing the difference between whip, mix, stir, and fold will certainly affect the result of your product. Probably of the general cooking terms which have irritated me over the years is the difference between a pie, deep dish pie and cobbler. Many seem to think that a cobbler is a pie with a little more fruit, even in eating establishments. I know of one baker that takes leftover fruit pies, break them up and sell them as cobblers. These are not cobblers! When I get hungry for a cobbler, I want a cobbler! A pie is thinner, made with either a bottom crust or a bottom and top crust of pie pastry. A deep dish pie has thick fruit on the bottom and a top crust made of pie pastry. Cobblers are made with a biscuit dough. Try this recipe to see the difference between the cooking terms pie and cobbler. 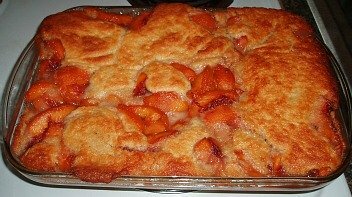 I made this recipe the other day when I wanted a cobbler. I made it with some of the peaches I froze but it is also good with cherries. It is delicious! Combine flour, 1 cup sugar and baking powder, cut in softened butter. Blend in milk, stirring to moisten; spoon batter into buttered dish or pan. Combine peaches, juice and remaining sugar (or other fruit) in pan; bring to a boil and pour over batter. NOTE: If fruit is sweet, cut back on sugar; this amount of sugar is for unsweetened fruits. Bake for 50 to 60 minutes or until center is done. One of the general cooking terms if you can vegetables during harvest is to BLANCH vegetables. This is so important to know how to do because it removes the skins on vegetables like tomatoes very easily and quickly; but if not done correctly it will cook the vegetable too much. A LA KING: Food such as fowl and bland meats served in a rich cream sauce. A LA MODE: Pie or cake served with a garnish of ice cream. APPETIZER: Small serving of food or beverage served before or as the first course of a meal. AU JUS: Cooking term for meat served in its natural juices. AU NATURAL: Food plainly cooked and served in its natural state. BAKE: To cook by dry heat usually in the oven. When applied to meats and vegetables, this is call roasting. BARBEQUE: To roast meats very slowly on a spit or rack over heat, basting with seasoned sauces. BASTE: To moisten roasting meat or other food while baking with juices from the pan or additional liquid. BATTER: A mixture of liquid, flour, etc. that can be beaten or stirred. BEAT: To work a mixture smooth with regular, hard, rhythmic movements. BEARNAISE: Hollandaise sauce with shallots, tarragon, chervil and other seasonings added. BECHAMEL: Cream sauce made with chicken and veal stock. BISQUE: A rich thick cream soup usually made from fish. Also a rich frozen desert usually containing powdered nuts or macaroons. BLANCH: To pour boiling water over a food, then drain and rinse with cold water. Used to whiten or remove skins from almonds or to prepare vegetables for freezing. BLEND: To mix two or more ingredients thoroughly together. BOILING: Various degrees of liquid bubbling when heated. BONBON: A sweet made of or dipped into chocolate. BOUILLON: Clear delicately seasoned soup usually made from lean meat stock. BRAISE: To cook meat or vegetables by simmering in a covered dish in a small amount of liquid, either in an oven or over direct heat. BROCHETTE: Small spit or skewer used for broiling meat cubes. BROIL: To cook directly under a flame or heating unit or over an open fire or grill. BRUSH: To spread food with butter, margarine, oil or egg with a small brush. Do you know how to CARAMELIZE? This is another of the general cooking terms you might want to remember. If this is not done correctly, it is a disaster. Turn your back and you will have a smoking burning sugar instead of sugar with a pretty caramel color. CAFFEINE: An alkaloidal substance found in the coffee bean, coffee leaf, tea leaf, cacao bean, etc. CANAPE: A small piece of bread spread with a highly seasoned food. CANDIED: Cooked in sugar or syrup when applied to sweet potatoes and carrots, fruit or fruit peel, to cook in heavy syrup till transparent and well coated. CARAMELIZED: Cooking term to heat sugar in a skillet until melted and brown or to heat foods containing sugar until light brown and of a caramel color. CAVIAR: Salted roe (fish eggs); originally from sturgeon. CAPON: A castrated male chicken; grows large and has tender meat. CHARLOTTE OR CHARLOTTE RUSSE:Usually a gelatin dessert with flavored whipped cream molded in a form lined with cake or lady fingers. CHAUD-FROID: Literally “hot-cold” gelatin sauce made with a white sauce base, used to coat cold meat, poultry and fish. CHICORY: The root of a plant that is cut into slices dried and roasted as coffee; leaves of plant are used for salads and are sometimes called curly endive. CHIFFONADE: A mixture of finely chopped fresh herbs used to season soups and salads. CHOP: To cut ingredients like vegetables, fruits and meats into small pieces with knife and cutting board. CHOWDER: A soup or stew made with fish or shellfish like clams and lobster and/ or vegetables. CIDER: The juice pressed from apples used as a beverage or to make vinegar. COAT: Cooking term to roll foods in flour, nuts, sugar, crumbs, etc until all sides are evenly covered; or to dip first in beaten egg or milk and then cover with flour or crumb mixture as in recipe. COOK: To prepare food by applying heat in any form. CONSERVE: Fruit preserves made with more than one fruit, often with nuts and raisins added. COURT BOUILLON: A richly flavored stock made from fish. CREAM: To beat shortening until smooth, creamy and light with wooden spoon or beater; usually applied when mixing shortening and sugar in cake making. 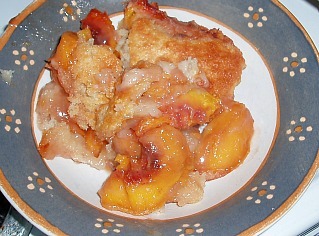 COBBLER: A deep dish fruit pie with a rich biscuit dough instead of pie pastry. COCKTAIL: An appetizer served before or as the first course of a meal; an alcoholic beverage usually served before dinner; Fruit or vegetable juice; cut fruit or shellfish with sauce served as first course of meal. COMPOTE: Sweetened stewed fruit, cooked to keep the fruit as whole as possible. CONDIMENTS: Food seasonings such as salt, pepper, vinegar, mustard, ketchup, herbs and spices. CRACKLINGS: Crisp particles after fat has been fried out; especially in pork. CREAM SAUCE: White sauce made with cream. CREPE: Thin pancake filled and rolled. CUBE: To cut into small chunks about ½ to 1 inch. CUSTARD: A cooked or baked mixture mainly of egg and milk; may be sweetened to use as dessert or flavored with cheese or meat as entrée. CUT: Cooking term to break up food into pieces with a knife or scissors. To combine shortening with dry ingredients using 2 knifes in scissor fashion or using a pastry cutter in pastry making. CUTLET: Small piece of meat cut from the leg or rib of veal or pork; or a croquette mixture in the shape of a cutlet. DEMITASSEE: A small cup (“half cup”) of black coffee, usually served after dinner. DEEP DISH PIE: Fruit pie with top crust only baked in a deep dish. DEVIL: To coat with hot seasoning, such as mustard or hot sauce. Eggs are deviled when the yolks are mixed with seasonings. DICE: Means to cut into very small cubes less than ½ inch using a sharp knife and cutting board or a dicing device. DOT: To scatter small amounts of butter, nuts, chocolate etc over the surface of food. DOUGH: Mixture made of liquid, flour, etc. that is stiff enough to be handled or kneaded. DREDGE: To coat food with dry ingredients like seasoned flour or sugar. DRIPPINGS: Fat or liquid resulting from cooking meat. Cooking term like to fold is very important in a recipe. If this is not done correctly as in an Angel Food Cake, the cake will not be light in texture as the cake should be. So you can understand how important it is to understand general cooking terms. ÉCLAIR: Small finger shaped pastry filled with custard or whipped cream. ENTRÉE: main dish of an informal meal or a subordinate dish served between main courses. FILET MIGNON: Tender cross cut slice of beef from the tenderloin. FOLD: To make large slow motions with spoon when blending; usually used when blending stiffly beaten egg whites. FONDANT: Sugar and water mixture cooked to a soft ball stage (234F degrees) cooled and kneaded. FONDUE: Baked food similar to a soufflé but including bread or cracker crumbs. FRAPPE: Sweetened fruit juice frozen until mushy consistency. FRICASSEE: Cooking term to stew meats, poultry, etc in stock or sauce. FRITTERS: Fruit, vegetables, meat or fish covered with batter or chipped and mixed with batter and then usually fried. FROSTING: A cooked or uncooked sugar mixture used to cover and decorate cakes, cookies and other foods. FRY: To cook in small amount of fat on top of stove to produce food with a crisp golden brown crust. GARNISH: To decorate any foods. Nuts, olives, parsley, fruit etc are referred to as garnishes. GELATIN: A purified protein found in connective tissues and bones of animals. GIBLETS: The heart, liver and gizzard of poultry. GLACE: To coat with a thin coat of syrup cooked to the crack stage. GOULASH: A thick meat stew originating in Hungary. GRATE: To grind into particles by scraper on a rough object like a “grater”. GRILL: To broil food; used when cooking food on a “grill”. GRIND: Means to put food through a chopper usually consisting of two or three blades. GUMBO: A richly flavored soup thickened with okra. Many people have problems understanding cooking terms like meringue; when beating egg whites. Do you know the difference in general cooking terms like mix and stir? HOLLANDAISE: A rich sauce made of eggs and butter, served hot with vegetables, fish and eggs. HORS D’OEUVRES: Salty, tart or crisp foods served as appetizers such as canapés, fish, pickles, olives, celery, sausage etc. ICE: Frozen mixture of juice, sugar and water. INFUSION: Liquid extracted from coffee, tea or herbs. KIRSCH: Cherry liqueur mainly produced in Switzerland. KNEAD: To work and press dough with the heels of your hands so the dough becomes elastic and smooth; usually used in yeast dough. LEGUMES: Vegetable seeds as peas, beans and lentils, usually referred to in the dried state. MACAROONS: Small cakes made with egg whites, sugar and ground almonds or almond paste. MACUERITE: A salted cracker spread with boiled frosting, sprinkled with nuts, coconut and chocolate pieces and baked until golden. MARINATE: To soak (in marinade) in dressing, vinegar, juices, wines or combinations before cooking. MARZIPAN: A paste of sweet almond and sugar. MELT: To heat solid food until it melts like sugar or fat. MERINGUE: A mixture of stiffly beaten egg whites, flavoring and sugar; used on pies etc. MINCE: Means to cut food in pieces but finer than chopped; can use sharp knife and cutting board or mincing utensil. MINISTRONE: Thick Italian vegetable soup. MOCHA: A flavoring made with coffee infusion and chocolate. MOUSSE: Mixture of whipped cream, sugar and flavoring frozen without stirring; or flavored thin cream and gelatin combined with meats, fruits and vegetables. MUFFINS: A drop batter baked in individual pans or served as quick bread. Do you know of a difference between cooking terms like parboil verses precook? PAN BROIL: To cook uncovered on hot surface usually a skillet; the fat is poured off as it accumulates. PANCAKE: a battercake fried on both sides on a griddle; sometimes called griddle cakes. PARBOIL: To boil food until partially cooked. PARFAIT: A frozen dessert made of a foundation of beaten egg whites or yolks cooked with hot syrup sometimes with whipped cream added; also applied to ice cream and syrup, all served in parfait glasses. PATE DE FOIS GRAS: A smooth richly seasoned pate made from goose livers. PATTY SHELLS: Shells made from puff pastry and filled with creamed shellfish, chicken etc. PEEL: Outside skin surrounding fruits and vegetables; to remove this skin. PETIT FOURS: Very small iced all over cakes; served for teas and parties. PILAF: A main dish made with meat, fish or poultry and rice, vegetables and spices. PLANK: To bake or broil meat, fish and vegetables on a wooden “plank”. Untreated wooden planks are often used on gas or charcoal grills. They are soaked in water for an hour, and then the food is put on the plank and grilled. POACH: Means to cook eggs, fish, and vegetables in liquid at or below simmering point or cook eggs over water in special “poaching pan”. POT ROAST: To brown meat in a small amount of fat, then finish cooking in a small amount of liquid. Cook in a deep heavy covered kettle or Dutch oven usually using tough cuts of meat. PUREE: A smooth thick liquid made by pressing cooked fruit or vegetables through a sieve. RAGOUT: A thick highly seasoned stew. RAMEKINS: Small individual casserole dishes. RAREBIT: A mixture of cheese, eggs, seasonings and white wine sauce usually served over toast. RAVIOLI: Large noodles filled with finely minced meat, vegetables or cheese, and then cooked in boiling water or stock. REDUCE: To boil a liquid until you have a small concentrated amount. RISSOLE: A nicely seasoned meat mixture wrapped in rich pastry and fried in deep fat. ROAST: To cook meat or vegetables in an oven by dry heat with no lid or covering. SCORE: To make light cuts or gashes in surface of food, usually meat like ham. SCRAMBLE: To stir or mix food gently while cooking as in “scrambled eggs”. SHERBET: Frozen mixture of fruit juice, sugar, egg whites and milk or water. SHIRR: To break eggs into a dish with cream or crumbs and then bake. SHRED: To cut into very small thin slices or strips. SIMMER: To cook in liquid just below boiling point. SMORGASBORD: Swedish appetizer or entrée course consisting of a large variety of foods usually set up as a buffet. STEAM: Means to cook by “steam” in a closed container. A container of liquid can be placed in a large pot with a rack over top; then the food is placed on the rack and covered with a lid. It can also be done in a covered skillet over low heat (Example: after washing spinach, place in covered skillet until it wilts). STERILIZE: To heat in boiling water or steam for at least 20 minutes until living organisms are destroyed. STEW: To cook foods, in enough liquid to cover, very slowly always below the boiling point. TORTE: Rich layers of cake made with crumbs, eggs, nuts and topped with whipped cream and fruits. TOSS: To tumble ingredients lightly with a lifting motion. TRUFFLES: Fungus that grown underground, used for garnishing and flavoring. TRUSS: To tie a fowl or other meat so that it will hold its shape during cooking; or to hold stuffing in. TUTTI FRUTTI: A mixture of many kinds of fruits. VELOUTE: Rich white wine sauce made with ham, chicken or veal stock, seasoned with bouquet garni. VINAIGRETTE: Dressing made of oil, vinegar and seasonings. VOL AU VENT: Patties of puff paste to be filled with meat, fish or poultry. WHITE SAUCE: (after whip) A combination of butter, flour, milk, cream or stock, seasoned and cooked until smooth and creamy. Knowing these general cooking terms will help you understand the recipe you are preparing. You might want to print this list out if you will be doing a lot of cooking; mark the general cooking terms and start by memorizing those.